First Aid Kit M-3 Medic Bag. Used by military medics. Comes in olive drab nylon shoulder bag measuring approximately 9 1/2" x 6" x 7". 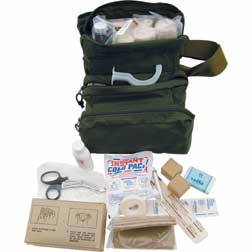 Contains 125 items for combat trained medics. Excellent kit for home, office or vehicle.